Gamaliel onosode is not dead! 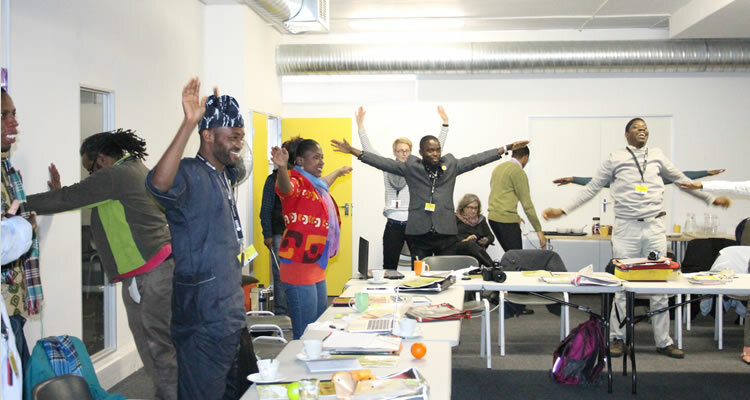 The African Arts Institute, with the support of the European Union and the National Lottery, recently hosted 22 African Cultural Entrepreneurs to a Cultural Entrepreneurship Training Programme in Cape Town, South Africa. The learning partners from fourteen African Countries who were selected to participate in the intensive 10-day business training programme, engaged on issues relating to Cultural Entrepreneurship on the African continent. The learning partners with range of experience in the sector include Talented “artrepreneur” performers, publishers, designers, musicians, activists, filmmakers, DJs and visual artists who have been experimenting and doing amazing work to bring about sustainability in the sector. The programme constituted a workshop on different content areas such as product development, financial management, idea development and business operations. Issues such as developing business that can close the gap existing in Africa between the “have” and “have not”, as well as justice and development of collective wealth to bring about qualitative transformation of the African continent were also addressed. This unique gathering of entrepreneurs which forms part of AFAI's “African Cultural Leadership Programme” has already graduated 200 trainees from over 40 African countries. The growing alumni network of creative leaders and inspiring visionaries from this programme forms a vital lifeline for the protection, promotion, enhancement and sustainability of the continent's creative assets and resources. Part of the ethos of the programme is to partner with local players where possible in order to build local capacities, and this year we are pleased to be partnering with the Cape Craft and Design Institute who provided the venue as well as co- facilitating the workshop with AFAI. The EU-supported African Cultural Leadership Programme lays the basis for five regional training hubs for Cultural Leadership, Train-the-Trainer and Entrepreneurship programmes including a professional placement programme. These hubs have been established by AFAI in Southern Africa, and by project partners Racines in Morocco, serving North Africa; by Groupe 30 Afrique in Senegal, serving West Africa; by Doual'art in Cameroon, serving Central Africa and by The GoDown Arts Centre in Kenya, serving East Africa. Other important partners include Arterial Network, Goethe Institut and National Lotteries Distribution Trust Fund of South Africa. The programme's ultimate goal is to advance the cultural dimension of development and cultural diversity in Africa through improved cultural governance. The Institute proposes to capacitate skilled leadership effectively to formulate and implement policies and strategies, and effectively to manage civil society organisations and public institutions. The programme targets young leading arts professionals, government officials responsible for culture, especially those responsible for implementing cultural policy drawn from the membership of Arterial Network –a pan-African arts and culture advocacy body with membership in over 40 African countries. Africa Enterprise is a publication by Hoofbeatdotcom Publishers, put together to promote entrepreneurship, with special interest in social and creative enterprise in Africa. Our project-support team cuts across different countries in Africa. Our mission is to showcase socially-responsible entrepreneurship as a model for the world, as well as serve as a platform for the Micro, Small and Medium Enterprises (MSMEs). Enter your email address to subscribe to Enterprise Africa Magazine and receive notifications of new posts by email.